Hotel des Arts, Paryż, Francja : Rezerwuj teraz! In 'La Bastille' area wellknown of its atmosphere with restaurants and bars, the Hotel des Arts offers you 35 rooms (single or double) . The hotel re-examines its image in this typically Parisian spirit: mid–trendy, mid–Parisian “tête-de-veau”. 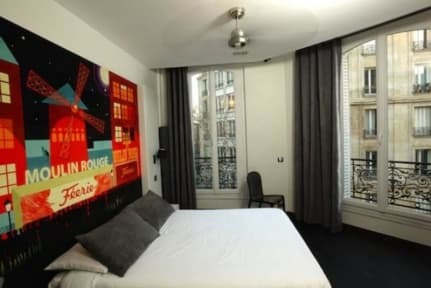 Hotel des Arts-Bastille is located in Paris, in the heart of the Charonne district, a 15-minute walk from the trendy Marais District and Bastille. It offers stylish, modern, soundproofed rooms decorated by local artists and free high-speed WiFi access. Hotel des Arts has 35 rooms. All room are equipped with shower and toilet. We also have free internet access.An excellent price for the cosy rooms. Breakfast not included - 9.50 EUR per person per day.